Murder on Air, the Agatha Christie Theatre Company’s latest production, revives their 2008 performance which retells three of Agatha Christie’s radio plays: Personal Call, The Yellow Iris and Butter in a Lordly Dish. The concept is to recreate how these tales were first told during their premiere BBC broadcasts with the actors (including special Glaswegian guests Barbara Rafferty and Tony Roper) standing in a chorus line reading their script while a Foley Artist (Alexander S Bermange) provides live sound effects. Personal Call is a haunting affair for one man, James Brent, who receives a call from a woman he knows to be dead. Poirot attends an anniversary party hosted by a wealthy American after he obtains a tip-off that murder is on the house in The Yellow Iris. The final play, Butter in a Lordly Dish, sees Sir Luke Enderby K.C pay his price for a long stint of infidelity. For us Scots, and for those who are aware of the long running Glaswegian sitcom, Rab C. Nesbitt, Murder on Air is also an exciting event heralding the return of Barbara Rafferty and Tony Roper, who notably played husband and wife duo Ella and Jamesie Cotter. The chemistry between them is still as vibrant as ever, even when they are portraying lovers to killers. Placed in a live studio setting, Murder on Air is a fresh experience which proves the amount of work invested into radio plays. The production is made to appear as though the cast haven’t rehearsed a dime, but it runs so smoothly that for the audience it feels as though they have memorised their lines, despite the script being right in front of their eyes. You have to respect the cast in a production like this. Two of the most powerful tools they utilise as actors for the theatre are stripped away in this drama: movement and facial emotion. This means they are solely left with their vocal chords to not tell us the story, but for them to be the story. Here we are able to witness that actors, even in the radio medium, do enjoy transforming their entire persona into their selected character. Despite not being able to dance as their character across their stage, the actors can still show us a glimmer of their character’s traits, to Roper’s enjoyment when he impersonates Poirot by shuffling towards the microphone. The best element of this production (which wouldn’t be witnessed in a theatre play) is the live sound effects crafted by Foley Artist, Alexander S. Bermange. From the relentless telephone ringing to the slippage of a glass; it is a fun spectacle that creates the majority of the humour. The performance would be severely lacking if it we didn’t have the chance to watch these sounds being created simultaneously to the dialogue. 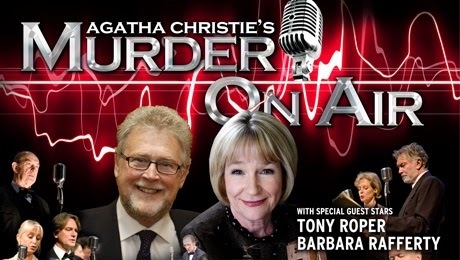 Murder on Air is a nostalgic performance of three radio plays from the Queen of Crime brought to life by a talented cast, and, for our Scottish eyes only, the reunion of two much loved actors, Rafferty and Roper. Murder on Air is at the Theatre Royal until Saturday 12th of July.